OOPA is an acronym principally used by "fringe" scientists/historians to refer to objects found in unusual locations. Wikipedia has a nice compilation of some OOPAs, including those debunked by mainstream science, and others confirmed as being validly "out of place." 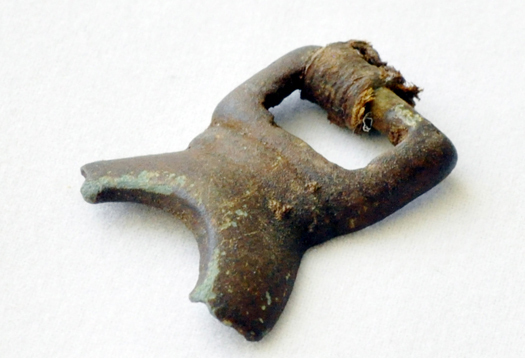 A team of researchers led by the University of Colorado Boulder has discovered the first prehistoric bronze artifact made from a cast ever found in Alaska, a small, buckle-like object found in an ancient Eskimo dwelling and which likely originated in East Asia. The artifact consists of two parts -- a rectangular bar, connected to an apparently broken circular ring, said CU-Boulder Research Associate John Hoffecker, who is leading the excavation project. The object, about 2 inches by 1 inch and less than 1 inch thick, was found in August by a team excavating a roughly 1,000-year-old house that had been dug into the side of a beach ridge by early Inupiat Eskimos at Cape Espenberg on the Seward Peninsula, which lies within the Bering Land Bridge National Preserve. Both sections of the artifact are beveled on one side and concave on the other side, indicating it was manufactured in a mold, said Hoffecker, a fellow at CU-Boulder's Institute of Arctic and Alpine Research. A small piece of leather found wrapped around the rectangular bar by the research team yielded a radiocarbon date of roughly A.D. 600, which does not necessarily indicate the age of the object, he said. To put the presumptive date into context, A.D. 600 would be several centuries before even the first known Viking settlement in North America at L'Anse aux Meadows. There was no metallurgy in prehistoric times in the Alaska region, so the object presumably came from Asia. More at the link. Photo via Alltop, where there is also a video. Based on what I see, p[lus the size (which I would have predicted), I'd say this was a buckle for a belt. Maybe all this is common knowledge and I'm out of the loop...till I read your posts. I dig ones like this. I would say it's the casing from an ancient watch, possibly the first Timex. Perhaps it depends on how you define "fraud" ?? Flying with little children during the holidays ? Where do everyone's exports go ?? Word for the day: "pleaching"
What are "city sevens" ? This boy "downloads music from his mind"
McRib - "no onions, no pickles"
The origin of the word "g-string"
"Brinicle" - an underwater "icicle of death"
"A Sunday Afternoon on the Island of UC Davis"
Trailer for Pixar's new movie "Brave"
"History is all explained by geology"